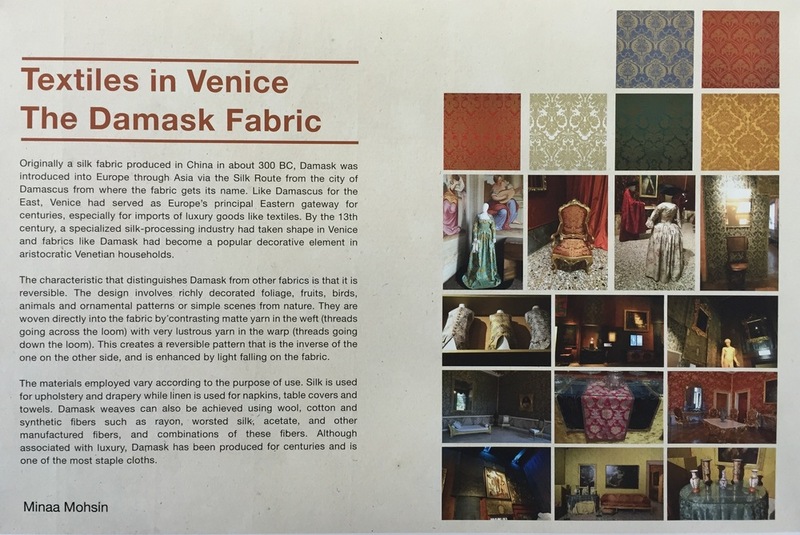 Each year, Pratt in Venice students contribute original research on various aspects of Venetian art history, materials, and techniques. Conducting research onsite is one of the highlights of the program. Students spend considerable time in the awe-inspiring libraries of Venice: Biblioteca Nazionale Marciana; Biblioteche della Fondazione Giorgio Cini; and the Biblioteca della Fondazione Querini Stampalia. Many of our Masters students continue their research to develop their topic into their thesis; some have gone on to publish their work in scholarly journals such as The Art Bulletin. 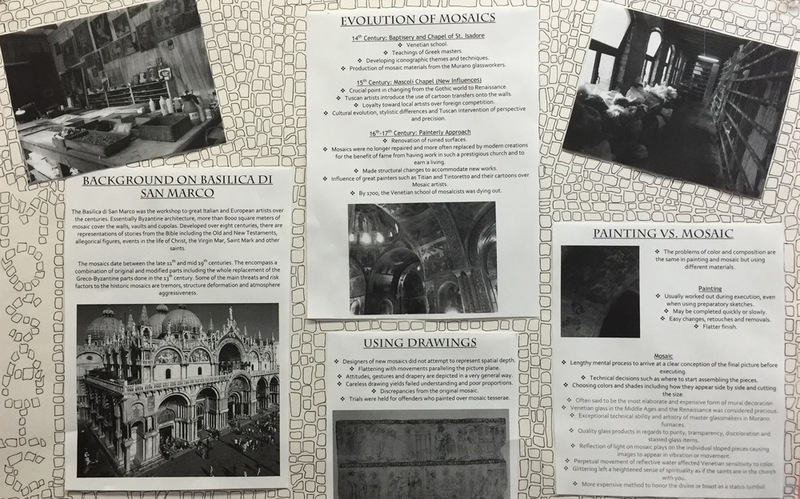 Each year, scholarship donations are crucial in permitting students to develop original research projects such as these in Venice. Please consider supporting the program. Olivia Cranney: "The Influence of Byzantium on Venetian Sgraffito Ware of the 14th–15th Centuries"
Kirsten Herman: "Carpaccio's methods and restoration in the Sant'Orsola Cycle"
Aomi Kikuchi: "Making Venetian Lace"
Jessica Niello-White: "A study of two painters and two paintings: Re-creating a Veronese and a Tintoretto"
Jenna Pasquino: "Le Zitelle: Form, materials, and function"
Aubrey Roemer: "Indigo and the Silk Road"
Marietta Burdick, "Palladio: Building San Giorgio Maggiore in a Benedictine Context"
Eleanor Gray, "Guide to Organic Venice"
David Jacaruso, "The Scuola Grande di San Marco and its Albergo"
Nick LaPole, "Tintoretto's Materials and Techniques – and Early Criticism"
Lauren Peterpaul, "Glass-Making in Venice"
Safiye Şentürk, "Silk-based Luxury Textiles: Cultural and Commercial Exchange between the Venetian Republic and the Ottoman Empire (1500–1600)"
Daisy Tainton, "Early Printing in Venice"
Mo Bone: "Defacing Art: Why Do We Care?" Chen-An Huang: "Carlo Scarpa in Venice"
Michelle Marshall: "Crown Glass/Vetro al Rui: History and Interior Application"
Sarah Maysonet: "La Villa di Maser (Villa Barbaro)"
Ariel Miles: "Gold and its Role in Creating Sacred Space"
Elizabeth Spearman: "Venice and Renaissance Pigments"
Celeste Tsang: "Venetian Stone, or Lack Thereof– In a Place where Stone is Abundant"
Saebra Waterstraut: "Identity Construction in Venice: Mirrors and Methods in the 14th–19th Centuries"
Xinyi Zhang: "Orpiment & Realgar"
Caroline Absher: "The Reliquary of the Arm of St. George"
Lara Allen: "A Treasure of Venice: The Foliage Room Ceiling at Palazzo Grimani Santa Maria Formosa"
Margaret Matz: "Architectural and Material History of Silk Weavers, Dyers and Merchants in Venice"
J.E. Molly Seegers: "The Theodoric Basilica of Aquielia & The Transitional Iconography of its Mosaics"
Diana Bowers: "Venetian Early Illustrated Books and the Work of Erhard Ratdolt"
Kelly K. Davis: "Roman Libraries and the Biblioteca Marciana: Ancient Ideals in Renaissance Venice"
Natalie Draeger: "Il Gran Teatro La Fenice"
Lilian Day Suber Thorpe: "Giovanni Bellini Used Advancements in Materials and Techniques to Express New Sensibilities"
Annalise Welte: "La Isola di San Lazzaro degli Armeni"
Andrew Kurczak: "From Lapis Lazuli to Ultramarine"
Elizabeth Meyers: "The Antique Sculpture Collections of Domenico and Giovanni Grimani: A Look at Renaissance Restoration Practices within a Collection"
Lawana Poopsoksakul: "Venetian Silk Brocade from the 13th to 15th centuries"
Emily Gumpel: "Fondazione Querini Stampalia: Carlo Scarpa"
Christina N. Manzella: "Punta della Dogana"
Aurelia Moser: "Rosso-Rame Multi-tonal Mosaici"
Daisy Lane Paul: "Technical Considerations of Wood Panels"
Clara Wanatirta: "The Influence of Materials and Structure of the Acoustics of San Giorgio Maggiore's Retrochoir"
Melinda Anderson: "Incunabula, The Aldine Press and Hypnerotomachia Polophili: Materials, Techniques, and Conservation"
Katie Gordon: "Can a Reproduction be made of Giovanni Bellini's 'Madonna Col Bambino Tra Due Sante' Using the Original Materials and Techniques?" Alexandra van Riel: "The Materials and Techniques of Tintoretto at the Scuola Grande of San Rocco"
Nina Accorsini: "Glass Mosaics at San Marco"
Jacqueline Merkher: "Venetian Stone Conservation"
Victoria Boardman: "Chemical Composition and Conservation Problems of Glass"
Cynthia Brenwall: "The Gilded City: Gold, Venice and the Art Market 1233-1500"
Hannah Brewer: "Tiziano Vecellio: 'Titian' Designs for San Marco Mosaics"
Joseph Kopta: "Nineteenth-century mosaic restorations on the counter-façade of Santa Maria Assunta, Torcello"
Gillian Sneed: "Tintoretto's Techniques of Painting Water, Light, and Spirits"
Andrea Fisher: "The Palette of Glass"
Julia Samuels: "Early Venetian Typography"
Kara Winters: "Venetian Stone Conservation"
Tage Haun: "The Campanile of San Marco: Fall and Rise"
Allyson Wolfe: "Titian's Techniques in "Presentation of the Virgin in the Temple'"
Simone Zuther: "The Medieval Mosaic Pavements of the Basilica of Saints Maria and Donato"
Maria Rossano: "The Architectural and Structural History of Venice"
Michelle Stanek: "Varieties of Stone Used in Venetian Construction & The Restoration of Santa Maria dei Miracoli"
Giannina Brusatin: "Giovanni Bellini: Canvas or Panel?" Catey Feehan: "Techniques and Materials of the Mosaics of San Marco"
Ann P. Gilmour: "Frescoes and Tiepolo"
Brynna K. Tucker: "Definition and Origin of Lace"
Stephanie Wooster: "Giovanni Bellini's Virtuosity"
Nathan Cochran: "The Materials and Pigments used by Giovanni Bellini"
Lauren Hoffman: "Bellini & Titian"
Yimei Chang: "The Basic Construction of Venice"
Inga Clough: "A Printmaker's Explanation to the Environmental Effects Upon Works on Paper"
Maiko Ota: "Mosaics of San Marco, Venice"
Shu-Ning Yang: "Early Venetian Glass"
Yuan Chang Day: "Evolution, Development, and Construction of the Gondola"